The Basics: Brand vs Branding vs Identity - What's the difference? People use these terms: brand, branding and brand identity as interchangeable synonyms every day, but they don’t mean the same. This is a more comprehensive version of the article I published on Medium a while ago. So, you found out about the power of branding. Maybe a friend-marketer told you that you should invest in brand identity and build your online presence as a brand. Or maybe you’ve read an article that briefly mentioned the word “brand”, whatever the case, you’re intrigued. But you also recognize a serious problem – you don’t know where to start. The dilemma: brand, branding or brand identity? What’s the process of branding and what does it really mean? And how should you go about this? Should you start with a logo design process? After all, the terms: brand, branding, identity and logo seems to describe one thing, don’t they? It’s all related to the design of a business (company, service or product). And when you think about famous brands like: Apple, Starbucks, Coca-Cola, IBM, UPS etc. you probably can recall their logos. Famous brands and their logos. In addition to that (if you encountered them before) you must have made some associations with these brands. Good or bad. Strong or weak. A logo is not your brand, nor is it your identity. Brand, branding, and brand identity all have different roles, that together, form a perceived image for a business, service or product. Therefore they all can be put in a bucket called business design, but they have different meaning. Many people think of design as either a purely aesthetic profession, or even an advertising discipline. But this is not true. Design is a problem-solving mindset well adapted to helping companies with a host of practical, real-world challenges. So in the next paragraphs I will elaborate on the differences between the terms: brand, branding and brand identity. Hoping you will be able to really grasp the meaning of them and understand the potential of each one. The word “brand” is used pretty loosely these days. For example, people might use the word “brand” to talk about logos, though a logo or identity is not a brand. But really, it’s much more than that. Brand is a set of intangible assets of a company, service or product. It is a definition of an emotional relationship between customers and the business. A brand is a person’s gut feeling about a company. Every day we discover new products and new businesses. Whether it is a new product in your supermarket, a new tech company or the airline you’ve never heard about before. Competition creates infinite choices and companies look for ways to connect emotionally with customers, become irreplaceable and create lifelong relationships. So with that being said, brand is not what you say it is – it’s what they say it is. People need emotional navigation. Let’s take a tribe for an example. A tribe is a group of people connected to one another, connected to a leader, and connected to an idea. People want connection and growth and something new. It’s like evangelism. Evangelism means convincing people to believe in your product or ideas as much as you do, by using fervor, zeal, guts, and cunning to mobilize your customers and staff into becoming as passionate about a cause as you are. Therefore a strong brand needs to stands out in a densely crowded marketplace. People fall in love with brands, trust them, and believe in their superiority. Take Apple as an example. There are brand fanatics out there who will buy their products even if it’s not any better or cheaper than the competition. How a brand is perceived affects its success. In one sense, perhaps the most important sense, a brand is a promise. Think of some top brands and you immediately know what they promise: UPS, Coca-Cola, Apple. The fundamentals of brand building, from listening to and learning from customers, to relevantly meeting their needs, have been magnified in a world of digital communications and consumer empowerment. Brand is a promise to customers. Delivering on a promise will keep customers happy and continue to build confidence in the brand. So to sum up: A brand is the way that your customer perceives you. So if brand is what they think about you, when you’re not in the room, then how you can influence that perception? This is where the term “brand identity” comes into play. Brand identity is tangible so it appeals to the senses. Brand identity is what you can see. It fuels recognition, amplifies differentiation, and makes big ideas and meaning accessible. You see it , touch it, hold it, hear it, watch it move. To put it simply: everything that you can see (the visual language) is brand identity. Starting with typography, colors, logo, identity system through layout, grid, composition, motion graphic to packaging (print design) and social media graphics, web design (digital design) and much more. Everything what is visual about a brand – we call it brand identity (or corporate identity, if you wish). How many elements a brand identity system consist of depends entirely on how many touch points (applications) needs to be designed for a brand. So next time you search for a “brand designer” you should rather considering searching for “brand identity designer” instead. Brand Identity is what we can see. The goal of a brand identity designer is to find artifacts that tell your story and engage people with who you are in a familiar and meaningful way. That means ensuring every time your artifacts show up, they are consistent in their appearance, use, size, scope, color, feel, etc. Some of these items are the name, logo, tone, tagline, typeface, and shape that create an appeal. Brand identity is a separate category from brand image. Identity guidelines document describes the tangible message the consumer receives from the product, person, or thing. And the key here is consistency. I’ve seen so many great companies that use their brand’s visual language inconsistently. Consistency allows your audience to build a memory structure around who you are and what value you have to offer. The main purpose of brand identity is to set guidelines on how to use those visual assets. Consistency in identity projects the corporate culture that surrounds the product. And this culture becomes the brand identity of your organization. Generally speaking, brand identity takes disparate elements and unifies them into whole systems. So the logo alone is not brand identity, but it’s a part of brand identity. How the logo is shown on applications, what typefaces and colors your company uses – all those aspect form the visual identity system. Therefore, the best identity programs embody and advance the company’s brand by supporting desired perceptions (through design). After all, design plays an essential role in creating and building brands (the process of branding). In fact, design differentiates and embodies the intangibles — emotion, context, and essence — that matter most to consumers. According to that, brand identity is what we designers actually do. So just in case you skipped through this article and somehow missed it. Designers do not design a brand, but they design is brand identity. A designer’s job is to create a desired perception by using any means available in terms of visual language. So far we’ve learnt that brand is a relationship and brand identity is the design. Brand is intangible and brand identity is tangible. We know that you don’t design a brand, but you build a brand instead. And we’ve learnt that what you design is brand identity. What we discussed so far comes together as the process of branding. It is a disciplined process involved in creating a unique name and image for a product, company or service in the consumers’ mind. Branding can be a genuine game-changer. To the creation of complex marketing and communications glue for countless global organizations. And the process of branding is done mainly through advertising campaigns with a consistent theme. With the consistent use of the brand identity (visual language) and the brand strategy underlying it. Companies leverage branding as a desire to lead, outpace the competition, and give employees the best tools to reach customers. So branding is both: tangible and intangible sum of a product’s attributes: it’s name, packaging, and price its history, its reputation, and the way its advertised. The process of branding is a communication of characteristics, values, and attributes that clarify what this particular brand is and is not. And it’s up to you how you communicate those characteristics. So make sure your communicate what you wanted to be associate with. Whether its your company, a product or you as a personal brand. 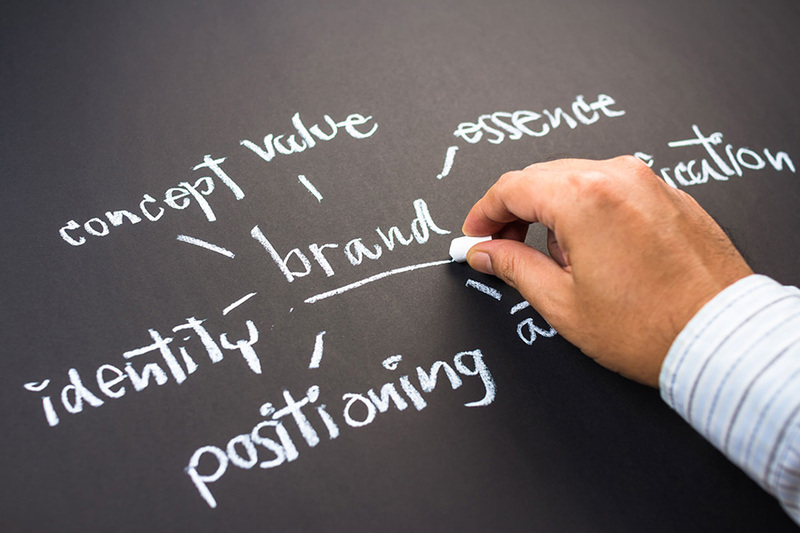 What ties those types of branding together is the desire to clarify of what is being offered. Whether it is a product, service or person – image and consistency (brand identity) play a huge role in branding. Branding is the BIG plan. It describes the expected results of a product or individual. But pay attention to the word “expected”. You may want your audience to see your brand e.g. as trustworthy, progressive and friendly. But how they actually see you may vary. brand associations – are anything that people link or associate with the brand in their minds. brand voice – how does your brand “speak? Do you use teenagers language or you’re more serious? Strong brands don’t just happen. They are usually the results of a long-term strategy that guides how a company does business and is tightly bound to its understanding of customer needs. Think about what you have to offer, what differentiates you, and use brand identity (the visuals) to match your core values, mission and vision in every point of contact with your audience. Brand is a relationship between customers and the business. Brand identity is what we can see, it’s the design of a brand. Branding is a process of building awareness and extent loyalty. You’re welcome! I actually plan on tuning this article into a short explanatory youtube video. Coming soon. Loved the article. Thank you for sharing. Great! What i really liked about your blog is crucial information about brand, brand identity and logo. Thanks for sharing this post with us. Thanks for the amazing post. This article clarifies and simplifies the complex concepts. This is really helpful.